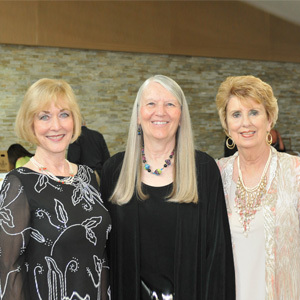 Bessie’s Hope co-founders Linda Holloway, Marge Utne and Sharron Brandrup. Linda Holloway, Marge Utne and Sharron Brandrup are co-founders of Bessie’s Hope. Follow them on Facebook and Instagram and learn more at bessieshope.org. Bessie’s Hope is the only organization in the country that shines a light on nursing home and assisted living elders through involving all segments of the community in volunteer programs. We provide education and training to volunteers of all ages, from preschool through adult. Our volunteers are equipped to have meaningful interaction with elders of all levels of cognitive functioning, including advanced Alzheimer’s disease. Youth groups, adult groups, families and individuals participate in the life-changing programs, cultivating mutually rewarding relationships with the elders. SIXTY PERCENT of nursing home elders receive NO personal visitors, thus enters the need for the Bessie’s Hope volunteers who replace loneliness and hopelessness with their loving touch and caring presence. The youth who participate, especially those labeled “at-risk” benefit as much as do the elders, because they feel valued, and they have the opportunity to internalize compassion, empathy and respect for self and others. These character traits are integrated into the core of their being, and they become responsible, compassionate adults. The youth in our program see the elders as wise, fun and wonderful, who have “amazing” stories from their life experiences. The elders are empowered through also feeling valued and through sharing their wisdom, guidance and love with the youth. Approximately 2,000 elders and 2,000 youth are served by Bessie’s Hope each year. Bessie’s Hope is committed to enhancing the quality of life for the nursing home elders and to bringing generations together in mutually rewarding relationships. 1. The tragic statistic that 60% of nursing home elders receive no personal visitors. This is unconscionable, and we are filling that void for as many as we possibly can. 2. Ageism—the youth and adult volunteers of Bessie’s Hope recognize that the elders have so much to offer all generations. We bring back the honor and dignity for those who have reached the age of “elder.” Our culture seems to view aging as ugly and repulsive, thus the reluctance to commit to reach into the nursing home world to embrace the elders by validating their value as human beings, who have “paid their dues.” Their wisdom, imagination and energy have created the communities we enjoy, but those communities maintain an “out of sight, out of mind” mentality toward those who can no longer remain independent and who can no longer care for themselves. 3. Thousands of youth fill residential treatment centers, and they also feel hopeless and empty, as do the nursing home elders. Because of Bessie’s Hope, many of these youth are able to leave the rut of hopelessness and turn toward a brighter future. 4. Bullying—experts report that compassion and empathy are missing in all bullies. When individuals have the opportunity to experience and internalize compassion and empathy, they cannot bully. Bessie’s Hope definitely impacts this. 5. Care providers who have no understanding or compassion for the elders should not be allowed to care for the vulnerable elders. It is this type of caregiver that treats the elders like inanimate objects that must be moved from place to place without touching or even conversation. Bessie’s Hope is initiating a School-to-Career project for youth who have experienced the relationships with the elders through the volunteer program. Being introduced to the vast array of careers available in long-term care, these youth will enter the care-giving field or administrative field for the right reasons. My grandmother, Bessie, was the inspiration behind the creation of the organization. Her nursing home experience was a revelation for my co-founders and myself. Being in “their world” now for almost 25 years, we are still dedicated to do what we can to bring honor, respect, dignity — hugs, understanding, and love to nursing home elders. These are the truly forgotten and invisible population. We must expand to be national, because there are forgotten elders in every nursing home across the country. We want communities to realize how urgent it is to embrace these beautiful human beings and listen to their wonderful stories. We impact ageism through showing the youth the value of interacting with elders. We want to offer more youth the opportunity to experience compassion and empathy. We need more financial support. We need corporate and individual partners who see the needs and the solutions that Bessie’s Hope addresses. We need more foundation grants, because while it is important to help aging people remain independent, not everyone can. While it is important to provide research to cure Alzheimer’s disease, it is also important to provide funding to Bessie’s Hope, who serves this population with love, understanding and dignity through education and hands-on activities and relationships with our volunteers. The largest challenge is having corporations, individuals and foundations recognize the need to make certain Bessie’s Hope not only continues but expands. We need monthly donors, whom we call our Bridge Builders, at any amount. Every dollar counts. We need major partners who will commit to annual contributions of $5,000 and above. We need more volunteers behind the scene to help with phone calls, fundraising events, becoming board members who aren’t afraid of fundraising, etc.